Austin 8 van enquiry of Attwood's Garage, Stafford. Homepage. This page: An original letter regarding the sale of a 1945 Austin 8 van, and 5-ton lorry, July 1945. 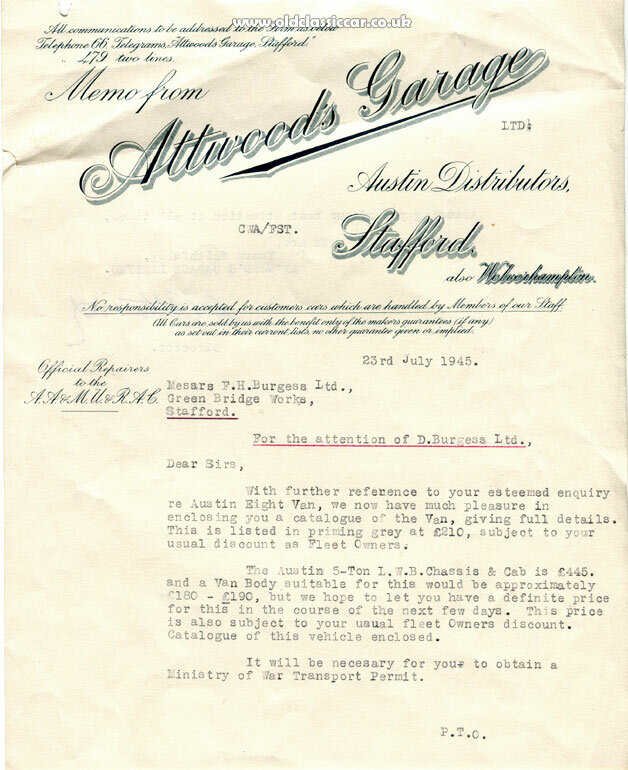 Attwood's Garage, officially-approved distributors of Austin motor-cars and commercial vehicles, had - in 1945 - addresses in both Stafford and Wolverhampton, this letter though was presumably typed-up at the former premises. It was addressed to Messrs F.H. Burgess Limited, of Green Bridge Works in the town, following an enquiry about buying a new Austin 8 van and a 5-ton lorry/van. The small van would cost 210 GBP before trade discount, whereas its larger brother was priced at 445 GBP for a chassis cab, the rear body was extra. Buying a new vehicle of any type so soon after the end of WW2 - in Europe at least - was far from straightforward. Raw materials with which to build the new vehicles were in short supply, so proof of the essential nature of the purchase had to be provided to the Ministry of War Transport, in order that a permit be granted, before an agency such as Attwood's Garage in Stafford could complete the deal. The requirement for a permit is referred to in this letter. Frederick H. Burgess ran a number of outlets in and around Staffordshire at the time, selling and repairing electrical items and general hardware and ironmongery-related goods. Would these services have warranted the issue of the necessary permits to purchase new vehicles, in the eyes of the Ministry of War Transport? Many years ago I was sent photographs of a Ford 10 van that had been purchased in just such a way, shortly after WW2. Its owner, a business in Wales, delivered Pink Paraffin to far-flung communities in and around the area in which they were based. Because of this, the firm was granted permission to buy a new Fordson van. Therefore I'm sure that Burgess' were also permitted to secure the purchase of the Austins that they were hoping to buy. Private motorists, unless they too could provide documentation to support the "essential" nature of their needs, had to make to with fettling up cars that had been laid up prior to the war, but were restricted in their mileage based on the fuel rations allocated to them. Austin K4, and the Austin Eight Van (AV1). The 5-ton Austin would have been an example of the K4 series, the K2 and K4 commonly referred to at the time as the "Birmingham Bedfords". The post-war Austin Eight Van (AV1 series), based on the Eight saloon's running gear, was a much more modest machine. Powered by a small, 900cc, sidevalve four-cylinder engine, it could carry a load of up to 6cwt, within its 82 cubic feet load area. Performance was modest, from its 27bhp engine, but was adequate for its typical role as a local delivery van, where outright performance was much less important than frugal running costs, ease of maintenance, and an easy-to-access load area. The scan below is taken from a single page flyer, that accompanies the above letter, dated in pencil to July 1945. (A van version of the "10" saloon was also offered, and offered a larger payload thanks to its greater overall dimensions). Austin 8 van, July 1945. "This smart and modern van will carry up to 6cwt with ample reserves of power and strength. It is a van built for Long Life with Dependability, presenting efficient transport with economy and simple maintenance. It is fully equipped, easy to control and provides full comfort for the driver. "There are wide doors for ease of loading, and the van floor is less than 24 inches from the ground. "A distinctive van which will prove to be an excellent business investment. Reference to production issues caused by the shortage of raw materials for use in vehicle production, in the months following VE Day, can be found on the flyer in red text. Evidently, production of Austin 8 vans relied to a certain extent on what was available at the time, so perhaps different grades of steel, and timber in the rear load area, found their way into the finished vehicles. "Owing to difficulties in obtaining supplies of certain materials due to the war, we are unable to guarantee the weight of this van to be under 12 cwt and within the 10 GBP Tax. 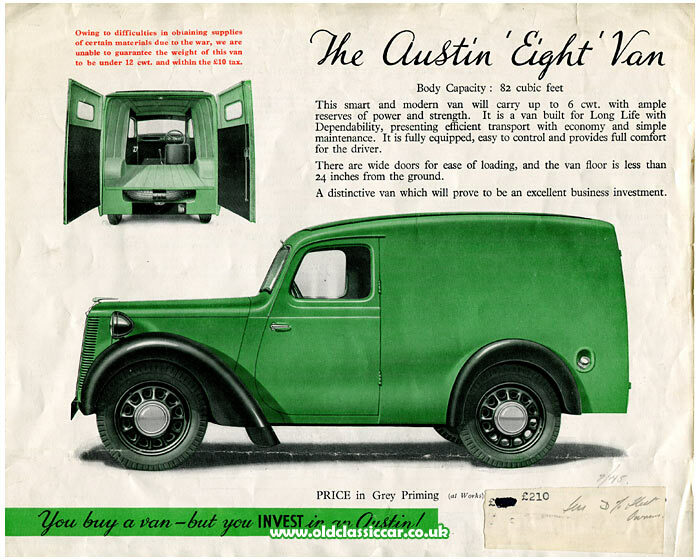 Only ten or so post-war (AV1 series) "8" vans are known to the Austin 8 Register, with just one pre-war (AV) survivor being accounted for. I wonder if F.H. Burgess managed to purchased one in the end? Elsewhere on the site, forum member Don (aka pigtin) recalls his adventures with just such a van, bought as his first "car" - read more about it here. A period photo of a van in RAC Service livery, can be found here. More period items relating to old vehicles, garages and dealerships can be found in the Motoring Collectables section of the site.